The Psychogenealogist Pic of the Week (#109) - Bucketed Berries? 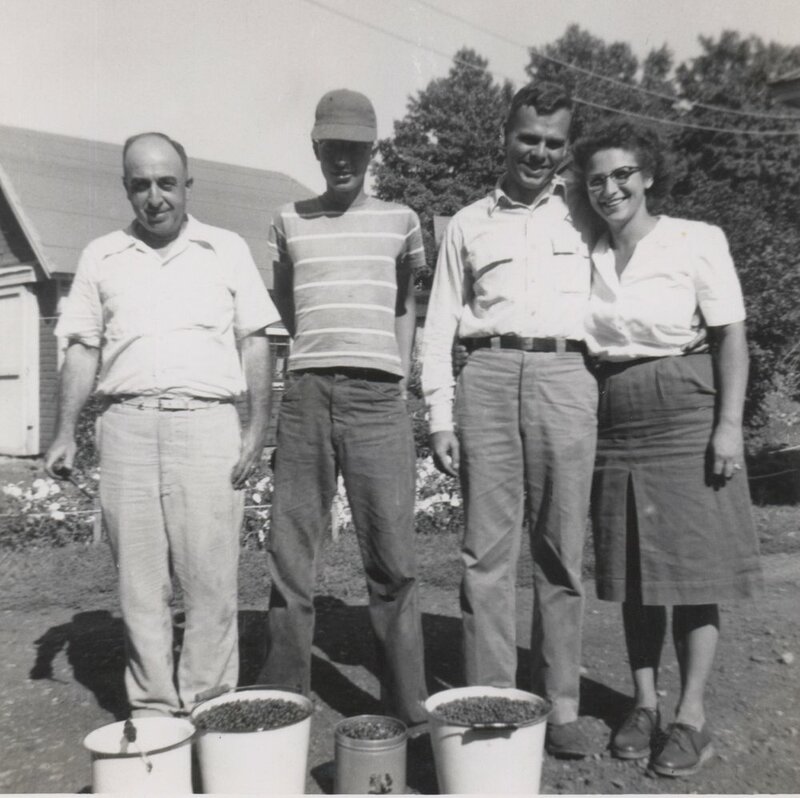 Here is a group photo, probably of family, proudly standing in front of their bucketed harvest. My first guess was that it was some type of berry, possibly blueberries, but it is hard to tell. I just love the couple on the right. Their smiles are genuine as they share an affectionate embrace. This photo reminded me of The Psychogenealogist Pic of the Week (#12) where a similar grouping of people are showing off various melons and a jug of wine. I’ve found that these type of photos are actually quite common. People seem to like documenting their harvests, catches, and creations. In my own family archives there are dozens of random photos of family members holding or standing in front of fish caught in local lakes or rivers. Here are some questions to consider as you look at this photo? Who are these people and what are their stories? What are in the buckets? When are where do you think this photo was taken? Do you have a favorite photograph like this one from your own family? I would love to see it! What do you think, feel, and wonder about as you look at this photo? I would love to hear your thoughts about these questions or other ideas that occur to you about the photo. Please feel to leave a comment below! Viola Waters Bedwell (1916-2000) and her work ethic - “If you didn’t work for it, it isn’t yours.” This is Part 3 of her “Storied Life”. Viola Waters Bedwell (1916-2000) moves her family north. This is Part 2 of her “Storied Life”. Fannie Viola Waters was born in Clarksville, TN in 1916. She would be known by her married name, Viola Bedwell. This is Part 1 of her “Storied Life”. Newer PostThe Psychogenealogist Pic of the Week (#110) - "Minnie's Mother, Sue H. Leig"